I have always had problems when it comes to my makeup sliding off my face, especially around my eyes, making me look very panda like! I've tried some cheaper setting sprays in the past, but found them to not be very effective, so I really wanted to invest in one I had heard good reviews about. I have very dry skin so make-up emphasizes this, hence why I went for the cooling and hydrating one. The first day I didn't follow the instructions at all and thought 2 sprays was waayy too little so I went ahead and must of put 6 sprays or more on..this was quickly regrettable when I went to check my makeup a couple of hours later and it looked aweful! Dry, patchy, dull..not good. I didn't give up, and on day 2 I simply put 2 sprays on from a distance..I felt instantly hydrated and it does definitely give an instant glow to the face which is great for a morning! I also noticed that my eye make up especially stayed on better than if I didn't have the setting spray on. 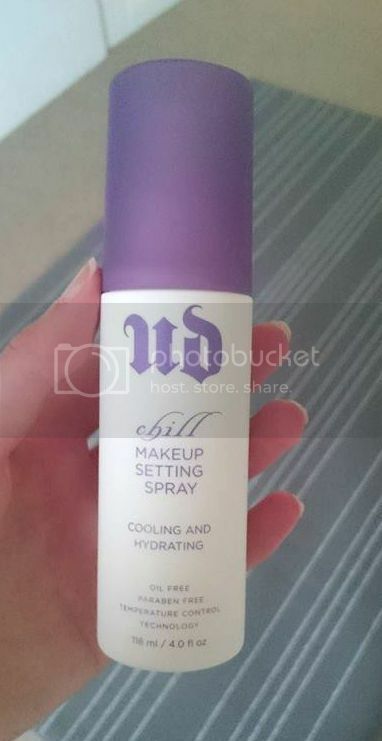 One thing I will say, however hydrating or cooling it is supposed to be, it's a setting spray..it's designed to hold make-up in place and I believe this never truly works to the benefit of dry skin as I feel afew hours in I am quite patchy in places. Overall I do however feel that If it helps my eye make-up stay put then it's worth the money because I have never found any product to help my eye make up stay put! What do you think of this setting spray? Any recommendations?